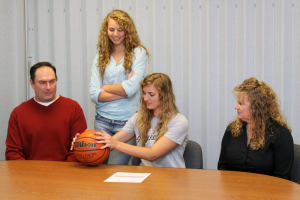 Kylie Ballard with her family as she signs her letter of intent to play basketball at the University of Indianapolis. KOKOMO, Ind. – For a high school student-athlete being asked by a college coach to continue playing the sport she loves at the next level is a dream come true. So think of the elation the Ballard family enjoyed when the University of Indianapolis asked Northwestern senior Kylie Ballard to play two sports in college? Ballard is a multi-sports superstar for the Lady Tigers. On the basketball floor, she is a 5-11 forward who was named a Top 60 player in Indiana by the Indiana Basketball Coaches Association, is a member of the 1,000 Point Club, and has the rare distinction of being a Mid-Indiana Conference first team honoree in all four years she has played. She finished her career with 1,085 career points, which ranks fourth-best among Lady Tigers. Only Kim Tussinger (1,331), Katy Hinkle (1,202) and Marci Norris (1,101) have scored more points while dressing in the purple and white. In Howard County girls basketball, she is the 24th best scorer of all-time. UIndy women’s basketball coach Constantin Popa is thrilled to have Ballard join the squad and agrees with Miller’s assessment of the potential for the hoopster to grow on the court. Ballard said one of the thrills of her career was getting to play with her sister, Hannah, who was a freshman on this year’s Lady Tigers team. According to Northwestern Athletic Director Dan Armstrong, Ballard, a member of the National Honor Society, is the kind of student-athlete that the entire school can look up to. “Earlier in the winter, I said how important she was to Northwestern,” he said. “Any time you have someone go to the next level to play sports, you are doing something right. For Kylie to go, it says something about Northwestern athletics and Kylie’s desire. I think that is awesome. And there is no doubt that Ballard will continue with her superior work ethic and will represent Northwestern and the Kokomo-area very well in the Circle City. This entry was posted in Basketball, IHSAA, Indianapolis, Northwestern. Bookmark the permalink. Congrats Kylie! Your friends and family are so proud of you!